"Where does all my money go?" A good personal finance management application like Buddi or HomeBank can help you to answer this question. Money is a serious matter that deserves a serious tool to help you keep tabs on your income and expenses. Why? Because tracking and managing your personal finances not only gives you an overview of your earnings and expenses, it also provides valuable insight into your spending habits over time. This insight, in turn, can help you manage your expenses and optimize your budget. Buddi  is a perfect tool for those who prefer to keep things simple. Although this application may look rather bare-bones, it provides basic tools for managing finances with a minimum of effort. As such, it is perfectly suited for users who are new to personal finance management. Buddi, which is written in Java, requires a Java runtime environment. On Ubuntu, you can opt for the OpenJDK Java runtime environment, which can be deployed with the sudo apt-get install openjdk-7-jre command. To install Buddi, use the latest .deb package from the project's website. Before you start using Buddi, you should configure its settings (Figure 1). By default, Buddi uses US dollars as the primary currency, so you might want to change that if you are not in the United States. To do this, choose Edit | Preferences , switch to the Locale section, and pick the desired item from the Currency format drop-down list. Figure 1: Configuring Buddi settings. If the currency you want is not included, you can add it manually by pressing the Other button and specifying the currency format. In the Locale section, you can also change the default interface language and data format. The View section lets you enable and disable a few handy options. For example, you can choose to display accounts and categories either as a flat list or a hierarchical tree. You can also enable the Cleared and Reconciled check boxes, so you can mark transactions as cleared as well as reconcile them with bank statements. If your bank account allows overdraft, you can enable the Show Overdraft Limit Information option. Finally, in the Advanced section, you can tweak the auto-save settings. Once you've configure the settings, you can start using Buddi. The first order of business is to add accounts and populate the application with categories. To do the former, switch to the My Accounts section, and choose Edit | Create Account . Give the account a name, choose its type from the Account Type drop-down list, enter the starting balance and overdraft limit (if available) values, then press OK . When working with accounts in Buddi, keep in mind that the application operates with two account types: credit (accounts to which you owe money) and debit (accounts in which you have money). For example, cash and checking accounts belong to the debit type, whereas credit card and loan accounts fall into the credit category. The next stop is the My Budget section, where you can specify budget categories. Using the commands under the Edit menu, you can delete the predefined categories you don't need as well as add new entries. 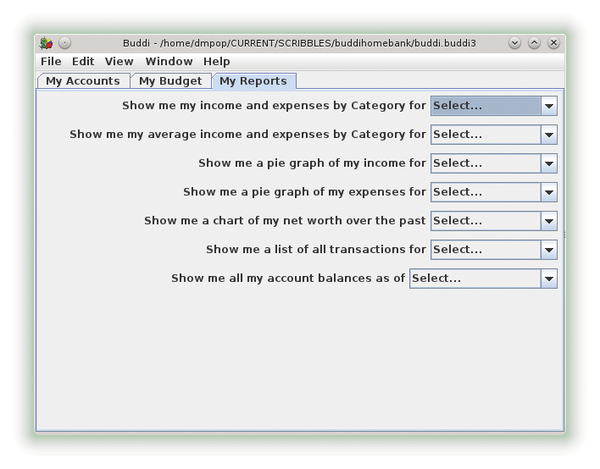 Buddi also supports subcategories, which allow you to keep better track of your expenses. For example, you can create a category called Books containing several subcategories like Fiction , Non-Fiction , Technical books , etc. Later, you can see how much you spend on books in general as well on each type of book. Next, you can populate Buddi with transactions. A transaction is a record of what you've spent money on, and which account you've used for purchase. For example, if you bought a cup of coffee and paid for it from your pocket, the transaction would be from your Wallet account to the Food budget category. To add a new transaction as well as manage existing ones, double-click on the desired account. This step opens the Transactions window with a list of all recorded transactions for the current account. If no record is selected, you can create a new transaction by simply filling out the required fields at the bottom of the window (at the very least, you have to provide the date, amount, and sources); otherwise, you need to press the New button first. Press Record to save the transactions. To modify an existing transaction, you simply select and edit it, then press the Update button (Figure 2). Buddi also supports so-called scheduled transactions, which can come in handy when you need to keep tabs on payments that occur on a regular basis, for example, donations, club membership payments, house rent, and so forth. Figure 2: Working with transactions in Buddi. To create a scheduled transaction, choose Edit | Edit Scheduled Transactions in the main window. The only difference between a regular and scheduled transaction is that the latter occurs on a specified date, so you have to add a payment schedule for it. Once you've done that, Buddi will automatically add a record to the transaction list each time the scheduled transaction occurs. Buddi supports reporting capabilities that can help you to make sense of all the entered data. Generating a report is as easy as choosing a time period from the appropriate drop-down list in the My Reports section (Figures 3 and 4). Using the available report types, you can generate pie charts of your income and expenses, display a list of all transactions, and show all income and expenses grouped by category, etc. Figure 4: … and it generates reports in the HTML format. Finally, you can extend Buddi's functionality by installing plugins. The list of available modules is rather short, but it contains a few handy plugins . 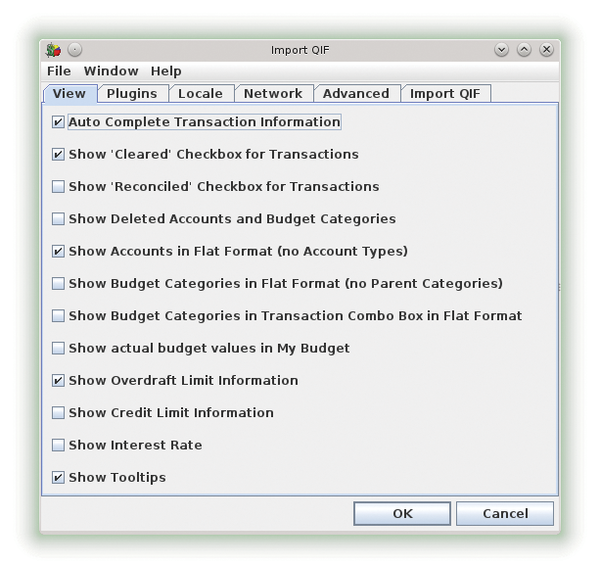 For example, the Import QIF to import financial data in the QIF format from other applications into Buddi. To install the plugin, download and unpack it. In Buddi, choose Edit | Preferences , click on the Plugins tab, press the Add button, and select the resulting .jar file. Restart Buddi to activate the plugin. Although HomeBank  is a step up from Buddi in terms of functionality, the former uses the same basic approach to managing personal finances as the latter (Figure 5). 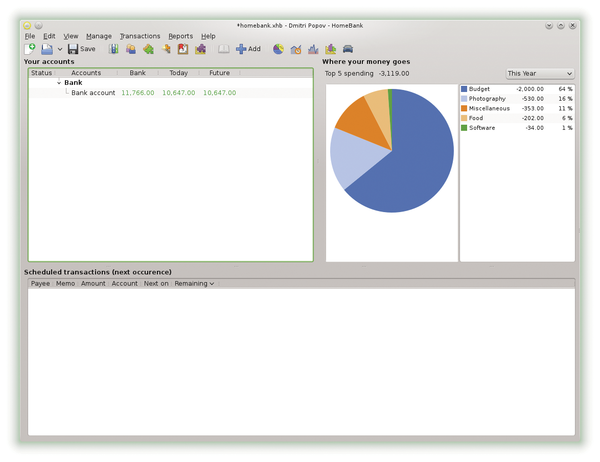 HomeBank has been around for some time, so the application has made its way to the official repositories of many popular distros, including Ubuntu. This means that you can install HomeBank either through the Software Center or by simply running the sudo apt-get install homebank command. 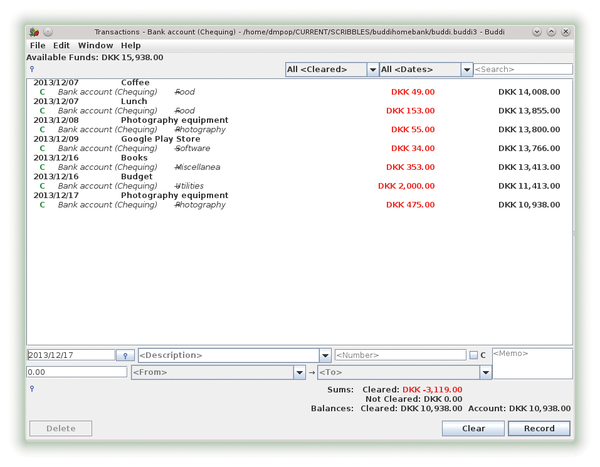 Figure 5: HomeBank features a streamlined and user-friendly interface. The first step is to create a wallet and populate it with accounts, payees, and categories. Choose File | New to create a new wallet. To add an account, choose Manage | Accounts and press the Add button. Give the account a name, then enter the account number and the name of the bank in the appropriate fields. Next, enter the current account balance in the Initial field. You can configure other options, if needed, and then press Close to add the account and close the window. Next, you need to add payees, or people and companies on the sending or receiving end of a transaction. Choose Manage | Payees and use the Add button to add payees. Finally, you have to specify categories, which is done by choosing Manage | Categories and adding the desired options. When creating categories for your income, remember to tick the Income check box. In addition to accounts, payees, and categories, HomeBank allows you to specify and configure other useful items. Assignments can be used to automatically assign a category and payee to transactions containing a certain text in the memo field. For example, you can create an assignment that automatically sets the payee to Amazon and category to Passive income when you add a transaction that has the Kindle Direct Publishing string in the memo field. Setting up an assignment is easy: Choose Manage | Assignments , press Add , specify the desired text string, payee and category, and you are done. 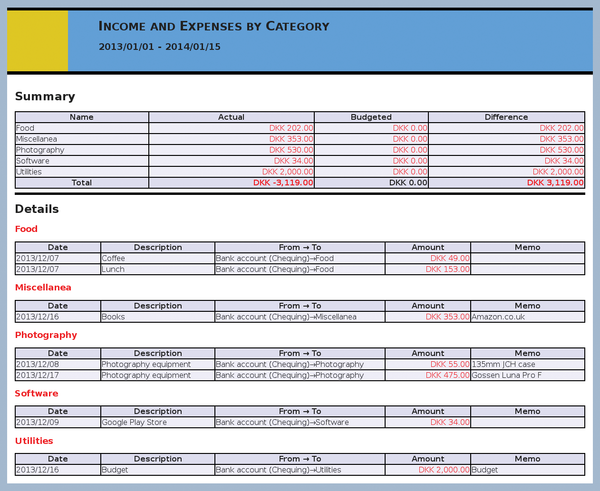 HomeBank also makes it possible to configure budgets, which can be handy for keeping certain expenses under control. For example, if you want to limit your book-related purchases to a certain monthly amount, you can set up a budget for the Books category. To do this, choose Manage | Budget , select the appropriate category, and enter the maximum allowed amount globally or for each month. Of course, this feature won't actually prevent you from spending more on specific items than you budgeted for, but it provides a strong psychological incentive to stay within the specified limit. As any personal finance software worth its salt, HomeBank supports scheduled transactions and templates, which you can set up and configure by choosing Manage | Schedule/Template . Once you've done the preparatory work, you can start adding transactions. Double-click on the desired account in the Your accounts pane and press the Add button in the main toolbar. Besides the standard fields, the transaction window contains two check boxes: Reconciled and Remind . You can use the former to mark the transaction as confirmed after you've checked it against your bank statement. The Reminder check box can be used when you are adding a transaction for lending money. When you tick the check box, the transaction acts as a reminder, and it's not included in the balances. The transaction interface provides several tools for working with transactions. Using the Range , Type , and Status drop-down lists, you can narrow the list of transactions to a specific period. The powerful Filter feature allows you to define rather sophisticated filters to display the transaction that matches specific criteria (Figure 6). 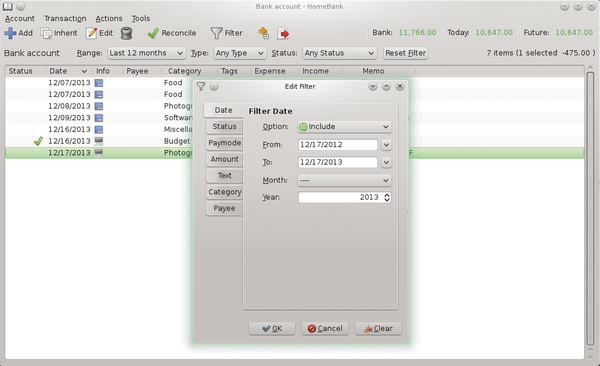 Figure 6: HomeBank boasts powerful filtering functionality. HomeBank features powerful reporting and charting capabilities which make it easier for you to analyze your financial data. 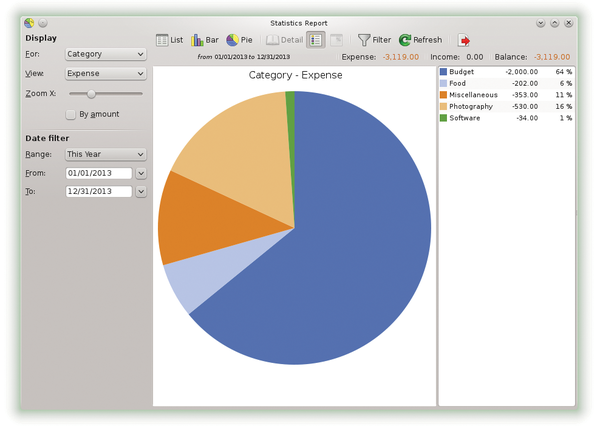 The application supports several types of reports, including general statistics as well as balance and budget reports (Figure 7). The statistics report gives you the ability to view transactions by category and type, filter transactions by specific criteria, as well as view them as a bar or pie chart. As the name suggests, the balance report provides tools for analyzing your balance, whereas the budget report helps you get an overview of your running budget and see it as a bar chart. Figure 7: HomeBank lets you generate different types of reports. A program for managing personal finances ought to be as simple and clear as possible. The Grisbi financial manager promises simplicity but doesn't support online banking. Crowdfunding can distribute the load onto many participants when making large steps in development. We'll take a closer look at what you can learn from the process. Jitsi is a versatile chat program. The Java program can handle all popular instant messaging protocols and even video IP telephony.